Family business Furniture & Design was established in 2006 in Kidlington, Oxfordshire with a desire to deliver hand-made kitchens and furniture that were sensibly priced and with a service that was second to none. The skilled craftsmen in our small team have a solid expertise and background in the traditional skills of cabinet making and have been designing and manufacturing bespoke kitchens and furniture in Oxfordshire and Buckinghamshire for over thirty years. 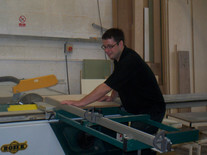 Since his days as an apprentice, Managing Director Darren Wells has been fascinated by the history of furniture. He has studied its place and purpose within the home and as part of family heritage, along with its influence on modern day design. Darren constantly draws on this invaluable knowledge which informs and inspires his ideas for the furniture he designs and builds for his present day clients. 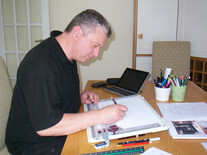 At Furniture & Design we provide you with a hand-drawn design plan. This is painstakingly produced down to the finest detail – a work of art in itself. And if you think that’s impressive – just wait until you see the finished product! 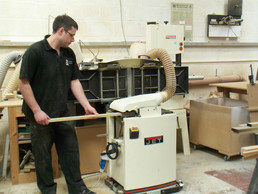 At Furniture & Design we are passionate about our work. 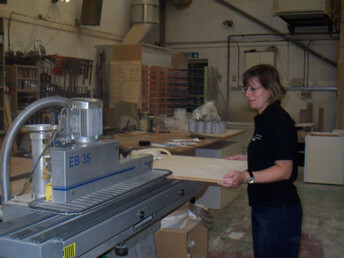 We design, manufacture and install top quality handmade kitchens and furniture. We also provide a full project management service, overseeing all involved trades: plumbing, tiling, electrics, building work, etc to ensure everything is completed as quickly and tidily as possible, with minimal disruption. That way you can relax and enjoy the transformation of the most important room in your home. We invite you to visit the workshop in Kidlington near Oxford where you can watch our cabinet makers use their traditional skills to work top quality materials into perfectly finished furniture. It is quite magical to see your kitchen being brought to life in this way! Selecting which company to work with on a major kitchen or furniture project is a huge consideration. There is an understandable concern that your dream may not turn into reality – or that it may even become a nightmare! At Furniture & Design we want you to be 100% satisfied with your stunning new kitchen. This is absolutely the most important consideration for us. We want you to be delighted with your furniture – and to go on being delighted for very many years to come. Most of Furniture & Design’s new projects come from personal referrals and recommendations in the Oxfordshire area and our clients are happy to share their experiences of working with us. So if you would like to speak to any of them, or even see their kitchens, please let us know and we will happily arrange this for you. Please ask them about our after-sales care too. We pride ourselves on giving outstanding service throughout the whole project and afterwards, so if you have any problems in the future we will deal with them immediately. One of the advantages of a Furniture & Design kitchen is that it can be repaired and serviced in years to come. If, for example, you feel you would like to change the colour of your doors, then we can collect, re-spray and re-fit them. And if an accident should happen – just call us – we will be able to rectify any damage.